I guess after you’ve achieved a goal you set your heart on, there is a period of coming down, the next twelve months seemed to pass by with no real development, no real achievement, I trained, I continued to train five times a week, but just seemed to tread water. It was one of those periods where I see where development was just slow. The summer of 1985 was a strange one for me, I contracted some sort of virus which just didn’t seem to let go, I was constantly feeling sick, I missed about six weeks of training, there were times when I got to karate and then suddenly felt sick, my Dad thought I was losing interest, it wasn’t that way, I was still very much into training, I guess there was an element of that, but this virus did hang around for a while. In either late 1985 or early 1986 Alan decided to add a special beginner’s class to the schedule on Sunday afternoon’s, but the revelation was the he wasn’t going to teach it, he would supervise, but it would be left to the junior black belts to teach new junior beginner’s the ropes. At that point I was the fourth most senior of the junior black belts, so I was in effect just an assistant, but odd weeks I would lead the class. I enjoyed this, one of us would lead the class while a couple of the other black belts or sometimes brown belts, would demonstrate in front of the class, the others mingled with the beginners, correcting them or showing them what to do. The class started off small, but eventually it grew to over thirty students, this was in the hay day of the club, the overall membership of the club was well over 150, although at that time there was only one other karate club in the town and they didn’t take kids. The junior black belts just kept coming, our the line up of black belts went from just the four of us at the end of 1984 and reached around twenty over the next few years, we had some promising students coming through, many showing much more potential than I had, many came through without getting any temporary grades and passed their black belt first time, in complete contrast to myself. So 1985 passed for me with no real success, for the first time there were no gradings for me to take and in the competitions I entered, I didn’t find any success, but as Alan always said, the best lessons were in failing, that was where we really learnt about ourselves, not from victory. The next year started pretty much the same way, but as our black belt section grew and we all trained together and pushed each other, things began to change. In October the regional championships came around, four years previously I had taken part in my first competition in the regions, that time only in kata, this time I was twelve years old and allowed to fight in the competition for the first time. At the time the current National Champion for my age group and height was from a club in Birmingham, he would be in the completion and he was a target for all of my club mates, he was the one we all really wanted to beat. For some reason I decided to fight defensively from the off, I would just wait for my opponent to attack and either block and counter quickly or move in to hit them before they could hit me, in the early round it worked and I kept to the tactic, all the while listening to the instructions from one of my instructors behind me. I was going well, so well in fact that Chris who was coaching me, missed the call for his competition, he wouldn’t leave the area whilst myself or any of my club mates were still in the competition. I made it through to the semi final and was drawn against Andrew from Birmingham, I stuck to the same tactics, I would wait for him and counter attack. It worked, I scored the first point, but Andrew went on all out attack as the time ran out, he didn’t score, but because he had managed to back me out of the area twice, it was given a draw, even though I was the only one to score. So we had to fight again, still I would stick to the same tactic and it worked again, I picked him off, scored the only point and this time stood my ground, when time was called, I had scored the only point again and was declared the winner, I was through to my first final and had beaten the current National Champion to boot, I remember bowing off the area and jumping straight into Chris’s arms, I’m not sure who was more pleased in that moment, Chris or myself. Come the final later that day, I would be facing my club mate Stuart, we knew each other quite well and knew how each other fought, he was still only a brown belt, but despite that he had already placed third in the National Championships. I think I under estimated him, I thought being the black belt, this was mine, I was wrong. The fight was over quickly, the first point happen almost immediately after the start, Stuart came in with a kick, which I still believe didn’t really connect and I countered, but his kick was scored, I was behind for the first time in the whole day. For some reason then I switched tactic and went on the attack and Stuart beat me at my own game, he waited, blocked and countered, scoring the second point he needed to win the fight. Still despite that defeat, I was still second in the region, there was over sixty kids in my category that day, I was second and had beaten the current National Champion, I had no right to be disappointed and I wasn’t, far from it. As December come around it was time to attempt my second day, the grading would take place on my thirteenth birthday, down in Slough. It was a long day, we left early and had to wait around so long before grading that, both myself and Darren who also went for his second dan, failed miserably. I don’t think we were badly prepared, I don’t necessarily think the waiting around was a factor, it was just a hard grading, with a lot of good kids and on the day we hadn’t come up to scratch, we would both have to wait a few months before trying again. It was only a couple of months before we would try again, so in February 1987 we went to Wellingborough to grade again, this time it was much closer to home and the waiting around wasn’t nearly as long. There weren’t that many juniors going for second dan that day, I believe it was just six of us, I was naturally the youngest and by far the smallest, the others were all a couple of years older and all Darren’s size, so when it came to fighting, they pulled out a young brown belt who had just failed his black belt, it was a little unfair on him. I wasn’t going to under estimate him like I had done a few month earlier, I went for it, I was all over him, in gradings it wasn’t acceptable to wait and defend like in competition, your were expected to show spirit and attack, so I did, I didn’t hurt the lad, but I never let him off the hook, I battered him a bit, the only time he hit me was with a kick below the belt, that just made me mad! This time I had done enough, I had passed, unfortunately Darren hadn’t, that made things hard, we were good friends and it was hard not to show too much jubilant emotion, when you knew exactly what he was going through having failed before, to Darren’s credit, he never showed it, in fact the next morning I woke to find a congratulations card through my door, we had that much respect for each other, when he passed a few months later, I returned the compliments and put a card through his door too. When May 1987 came around it was time for the National Championships again, as always at Crystal Palace, the junior catagories were getting bigger, there seemed to be more kids there each year and as usual, we were put in the smallest hall, out of the way of the crowds, but crammed into a small gym, hundreds of kids, not ideal, but we were all in the same boat. I rode my luck to say the least that year, I made it through to round three and there I drew a lad called Ian, it was the first time he had competed, but he came with a reputation, his bigger brother was on the England National Squad and in the World Championships the year before had made the final, decisively beating the Japanese favourite on the way, so a lot was expected of Ian. I was using the same tactics, wait and counter attack, but Ian didn’t give me chance, he was fast, he came in with a back fist, which hit me smack bang on my left ear, hard, I went down and the next thing I know he was on top of me, just punching away at my head. He had gone over the top with his aggression and control, the referees disqualified him and awarded me the fight, I was through, but I would rather have won the fight fair and square. I did get chance to fight Ian again a few years later, this time he fought cleanly and beat me hands down. After that regaining my composure, despite the fact it felt like my ear had doubled in size, I made it through to the semi finals, there I faced a boy from Sunderland called Marc, he was good fighter and fought very similar to how I did, but he was faster than I was and beat me soundly, it was probably a fight to far for me, but I had made the semi finals and collected a bronze medal later that evening, it would be almost twenty years before I collected another medal from the Nationals, but I was happy with that one and Alan, my instructor was over the moon. Later that day though I took part in the kata, in the first round I was against probably the smallest and youngest boy there, the judge announced the kata and told us both to begin, I started and then glanced across at this kid, he was doing a different kata to me, then I realized I was wrong, I had heard the right kata, announced the right kata, but was doing the wrong one, I stopped and just stood there as this kid finished, rightly he was awarded the win. When I sat down, one of the corner judges turned to me, he said to come back next year when my head was on straight, well to be honest it didn’t matter, I was getting that bronze medal later, that was all I was bothered about! After that period of treading water following passing my black belt, I had now in just over six months, come second at the regionals, passed my second dan and won bronze at the nationals, I was beginning to achieve a potential, that had you seen me when I first started, you wouldn’t think anyone like me could achieve. How did we come to thinking this was funny? This entry was posted in Karate and tagged Black Belt, Compete, Competition, Flyleaf, Karate, New Horizons, Second Dan, Training on November 9, 2015 by waynemali. November 1984 seemed to come around very quickly, it was just four months since my last try at my black belt, that was a miserable attempt and since then I had gone back to training five times a week, it was hard work, but I was determined and Alan was pushing me hard, there were a number of other students of a similar age that were climbing the grades and getting to train with them also, helped to push me on. But as November started, it all nearly came to an end. We had a family tradition on Bonfire night, in the half term school holidays, all the kids would go to my Nan’s in the day time, while out parents were at work. The boys, myself and my two cousins, took responsibility for building the bonfire, I was the youngest at ten, the other two being 14 and 15, the girls took charge of making the Guy and making bonfire toffee with my Nan. We always made a big bonfire, then on bonfire night, the whole family would descend on my Nan’s, my parents and my Aunty and Uncles would bring a selection of fireworks and we would all enjoy the evening. This year my cousin decided to add a little extra to the proceedings, somehow he managed to find a recipe to make homemade bangers. All of the components were available for even a 10 year old like myself to buy over the counter, so we made a number of these in varying sizes. They worked, in fact the worked better than the over the counter bangers that could be bought at that time, a few years later these would be made illegal, but back then bangers were common at bonfire night. I wasn’t involved in setting any of them off, my cousin did, I must add, under the supervision of my uncle and at no point was anything considered unsafe. The night was going well and everyone was enjoying themselves. As the evening went on I began to feel my eye starting to itch, I rubbed it, but it got worse and worse, getting more irritating as the night went on, eventually I went to my Mum, who took me inside to take a look, then it became obvious that something was wrong. My eye was far worse than just itchy, my eye lids were red raw! Immediately my Mum and Dad took me to hospital, surprisingly it was quiet, so we were seen quite quickly. The nurses in casualty were concerned and called a Doctor that specialised in eye injuries. It transpired that both my eye lids were burnt, it would seem that something and probably the sellotape that we used in the bangers had gone into my eye. The Doctor stated that I was lucky, I must have blinked at that moment, because my eye lids were both burnt, but there was no damage to my eye itself. Had I not blinked, the melting sellotape would have gone directly into my eye and almost definitely left me blind in that eye. I had had a lucky escape, just superficial burning, I was sent home with paste to put onto my eye lids at regular intervals, but other than that I was fine, just an eye that was uncomfortable due to the scabbing of both eye lids. They say things can change in the blink of an eye, I learnt the truth of that sentance on that day. I went to karate on the next night, it was a normal Tuesday training session, I went only to watch, not take part, my eye still looked a mess, though I could still use it. Alan then broke the news that there was another grading on the Saturday, up in Newcastle, he could get me a lift there and he wanted me to try again. Between Alan, my Dad and myself it was decided I would go for it again on Saturday, as my eye was mainly just cosmetic and not anything permanent, it wasn’t too much to worry about. So Saturday morning I left my house about five in the morning, a parent of some of my club mates took me to Lincoln, there I met up with one of the seniors from our Lincoln club, who walked me to his sister’s house and she took us both up to Gateshead, near Newcastle. We had set off early and then arrived early too, that gave us plenty of time to put in the grading forms, both Simon and myself were grading, so Simon copied the details of my previous grading form and submitted my new forms. This was only the second time I had trained with Enoeda Sensei, my previous black belt gradings had been under a different examiner. Enoeda Sensei was an imposing character, he just had that air that he carried with him, he looked serious and really did scare me. I was on my own in the training, I was with all these kids I didn’t know, whilst Simon trained with the adults. We practiced a series of moves, in a combination that involved a number of turns, then Sensei requested we get into groups of three. All the other kids around me obviously knew each other, they all got into groups very quickly and when I looked around there were no other kids to go with, I was on my own. So I just carried on practicing the combination on my own, whilst everyone else practiced in groups. That was when I saw Enoeda Sensei coming my way, I panicked, I kept my head down and just did what I was doing as best as I could, after I finished the combination, I looked up to see him stood right next to me, I expected a telling off for not getting into a group with the others, then I saw him smile at me and raise one of his hands to give me a thumbs up. Wow, I expected being shouted at, I was almost ready to cry, my shy and nervous side was ready to explode, but that smile, that thumbs up, just washed away all those nerves, after that my energy levels seemed to double, I was on cloud nine, I was flying. There was a bit of waiting around after training, whilst the next group trained, then the grading itself started. The younger kids were usually first, so I was in one of the first groups of six called up. My name was called and I took my place in the line before Sensei, then there seemed to be a pause, something was being discussed on the table, then Sensei pointed at me and called me to the table, my heart sunk, all the positivity of the mornings thumbs up was now ebbing away. I looked down at the paperwork and to my horror, Simon had put my date of birth as my last grading date the previous November and in that box put my date of birth, it was an obvious mistake, but Sensei saw the funny side, normally he would probably have rejected the paperwork, but he laughed with me as he corrected the paperwork and with that same smile I saw from him earlier that morning he sent me back to my place in the line up. But once again, Sensei’s smile had put me back on cloud nine, I went back to the line, gave everything I had and waiting with the rest for the result. Back then you sat through everyone else’s gradings and waited to be called up again, if you were called up a second time for another kata, you had pretty much passed, unless you messed up that kata, I was called up a second time, flew through the kata and a little late my pass was confirmed. Simon hadn’t passed, but you couldn’t tell, he was over the moon for me, it seemed it meant more that I passed than the result of his grading, he never showed any disappointment, I’m sure he had some, but he did a great job of hiding it. We found a pay phone (no mobiles back in 1984) and I called my Dad and told him the news, I remember us both being in tears on the phone. I don’t remember the ride home, it was long, but it passed so quickly, I got home and within minutes Alan turned up at the house, he was over the moon, I could see it in his face, he always took great pride in any of his students passing their black belt, but it seemed more so with me. The next few days were interesting, there weren’t many ten year old black belts back then, especially not in Nottinghamshire, Alan contacted the papers and I had arrangements for interviews and photoshoots. One of the papers came to my house and photographed me in my front room, another arranged to come to my school, it was a little embarrassing to have to perform barefooted in a wet school playgroup, in front of a handful of friends, whilst being photographed, although that paper did give me the nick name the mighty atom! The previous day I had been mentioned in the local paper, not by name, but I was listed as being the only Bonfire night casualty in the Newark area, not my most shining moment, then just seven days later, I made the paper for all the right reasons. They were six days that were a complete rollercoaster, from almost losing the sight in one eye to obtaining that black belt. Then there were those moments during that grading which just changed things, to this day I still feel like I must have been Enoeda Sensei’s favourite student that day, he saw something in me and knew exactly how to respond to my shy and nervous persona, maybe I wasn’t his favourite student, but just for those few hours, it felt like it. Life can change in the blink of an eye sometimes, had I not blinked that Monday evening, would I have done everything I have since then? Would I have gone on to get that black belt, well maybe, probably not that day or in those circumstances, but I may have carried on, but everything that I have achieved in Karate since that day, has happened because of that one moment, that one blink. Back then and through most of my life I haven’t been a Christian, I never believed, but now I firmly believe that at that moment, that blink of an eye was a moment when God’s touch was on my life. Karate has been a major part of my life, a major part of the good that is in me, even in my lost years of drinking, it was only karate I stayed sober for, I’m sure it kept me alive in those years, it was the only thing that went right for me as the world around me crumbled, had it not been for that blink of an eye, well, I don’t even want to think about that. What is it I’ve done with my life? This entry was posted in Faith, Karate and tagged Accident, Black Belt, Blind, Blink, Christ, Enoeda, Enoeda Sensei, Faith, Fireworks, God, Grace, Grading, Hope, Jesus, Karate, Mercy, Revive, Sensei Enoeda, Training on November 2, 2015 by waynemali. 1983 was a tough year, at the beginning of the year passed my 3rd Kyu, which is the first brown belt of three brown belts, now the real training began, most people recognise that brown belt is the belt before black, so once you make it to the first brown belt, the kata you learn is generally the one you then use for your black belt, the grading syllabus is generally the same, it the technical detail that must improve each time. I passed all these gradings and by the end of the year had received my 1st Kyu, next step was black belt, a minimum of six months training and preparation. Early that year Alan had started a club in Lincoln, it ran on Friday nights and then eventually Wednesday nights too, I began to travel with Alan on Friday nights to Lincoln, at first it was only me that wanted to go, eventually others higher grades came with us too. By the time I passed my 1st Kyu I was training five times a week and it was hard training, Alan pushed us hard, he wanted us to succeed, he was hard but fair, always fair. One thing he didn’t stand for was any kind of bullying, he wouldn’t have anyone taking liberties with other students, higher grades were to be fair and work with the lower grades and not be hard on them, push them, but not use them as canon fodder, he was keen on that. One thing he wouldn’t stand for is anyone laughing at other students, he would get the different grades up to do their kata in groups, if one of them went wrong and any other student sat down laughed at them, he would get them up straight away, he would sit everyone down and make the student who laughed do their kata, whilst encouraging everyone else to laugh at them. I was a victim of this once, I never did it again, I guess if I did that now, I would be pulled over the coals for it, but back in the early 1980’s it wasn’t so frowned upon, as I said once you had got caught, you never did it again and as higher grades, we sort of began to police and school the other students, make sure none of them fell foul of the rules and made the same mistakes as we had done. In May 1983 I took part in my first National Championships, I was only just a brown belt and for the first time came up in a category with black belts, we didn’t have a junior black belt in the club at that point, that wouldn’t happen until later that year, I think the youngest black belt in the club at that point was about fifteen and he had quit training a year or so before. I think Alan fudged the entry forms somewhat, to be fair it was common practice among all the Club Instructors to be liberal with ages on entry forms, the minimum age for fighting was 10 years, I was nine and not ten until seven months later, but I was entered in the fighting. I wasn’t sure what to expect at this level and when I was called up for the first round against a black belt, I decided to just get stuck in. I’m not sure either of us had much technique, more just youthful exuberance, somehow I won that fight, against a black belt, I was over the moon and my Dad who was watching was too. I lost my second fight against another black belt, but that didn’t matter, I had beaten a black belt and that was my medal, together with the bruises and black eye I collected along the way. I remember that competition well, the fighting especially, it was at Crystal Palace and we were on one of the mats on the balcony, which was a first because usually the kids were downstairs in one of the tiny gyms, there would be hundreds of kids squashed into these small rooms. I think the kata was downstairs, I don’t remember anything about that really other than I lost in the first round, my one victory in the fighting was enough to make my day. There was still a matter of two gradings to pass before attempting my black belt, thankfully I got through those okay, I don’t think I blitzed them, but I did enough to pass. By this time I was training five times a week, every week, three times at my home club in Newark and twice at our sister club in Lincoln, it was hard training, but good, always good. My first attempt at Black Belt came in April 1984, it was up in York and my first time training at one of these courses, never mind attempting to grade. I remember training at Lincoln the night before and everything was a mess. I couldn’t remember half the katas I needed, not that I didn’t know them, any other night I wouldn’t have had a problem, maybe it was nerves or apprehension for the next day, but I couldn’t get them right, half way through one of them I remember just having a complete memory blank, I just didn’t know what came next, to this day, I’ve never again had that problem, but that Friday night, I was lost. The next day was the black belt grading in York, it wasn’t at some grand leisure centre, it was in the sports hall at Imphal Barracks, Fulford in York. It was basic to say the least, just one large hall, small changing rooms and no refreshment facilities. Hundreds of people came to train and over a hundred were there to take their grading, so it was a little cramped. Five people from my club were grading that day, including me, I don’t remember much about the training and very little from my grading. I do remember the free fighting, I really enjoyed that, the lad I fought went on to become National Champion a couple of years later, but that day I gave as good as I got. Unfortunately though I failed everything but the fighting, the gradings are split into three parts, basics, kata and fighting, the basics pretty much count for most of the grading, if you fail that, you fail everything. To pass you have to pass all three, if you fail kata or kumite, you still fail, but next time you only have to retake those elements, fail the basics you retake everything, fail two out of three, you retake everything also. So I had failed and therefore had to redo the whole grading again. In truth, I was just ten years old, still pretty young, but also it’s a requirement that there is a minimum of six months between passing the last brown belt and attempting black belt, I was a couple of weeks short of that, my instructor put me and another couple of students in regardless of this requirement, he later stated you would have to be exceptional to pass if you fell foul of this rule. Three out of the five of us passed that day, Stuart an adult member of our Lincoln club, Darren who was a couple of years older than me and always been a couple of grades ahead, he had already failed once, but passed on this occasion, then there was Trudy, she had come through in the same group as me, but she was good, very good. It was a bit of knock back to fail, it’s hard when good friends have passed, you want to be happy for them, but at the same time, your world has fell apart. After that I stopped doing the extra training sessions at Lincoln for a while, I guess it knocked my enthusiasm somewhat, I trained hard when I trained, I just didn’t train as much. In hindsight, that was wrong, looking back if I wasn’t good enough to pass when I was training five times a week, how was I going to be good enough to pass if I was only doing three. Well the proof came just three months after that grading. My second attempt came at Lincoln in July 1984, in truth the training didn’t go that well, the instructor picked me up on a number of things and it seemed to blow my confidence. The outcome was the same as before, I failed the kata and basics, but passed the fighting. I think I actually did better the first time around, I can’t put my finger on what went wrong, I simply was nowhere near good enough, now I had to wait another three months before I could try again, one thing was for sure, it was back to training five times a week. Were you born to resist or be abused? Is someone getting the best, the best, the best, the best of you? Are you gone and onto someone new? Has someone taken your faith? This entry was posted in Karate and tagged Best Of You, Black Belt, Brown Belt, Competing, Competition, Foo Fighters, Grading, Karate, Training on October 26, 2015 by waynemali. What Really Is Pain, Can We Hide It? These are mine, these size seven hairy hobbit feet belong to me, even the black and blue, bruised one! Now you’re asking, what the heck? How did you end up with a foot that colour and shape? Ouch!!!! This misshapen mess happen back in August 2009, just two months before I took these battered feet and started a journey into complete and utter darkness and despair, it was a result of the last great thing I achieved before slipping from reality for a while. The strange thing is, I don’t remember actually doing the damage, not once apparently, but twice, I don’t remember a feeling of pain, not until hours later anyway, the occasion was greater than the pain, the mind was focused elsewhere, I was lost in the moment, a determination for the end goal suppressed everything else. My karate is obviously something I have discussed on the odd occasion on this blog, although it is not a big part of my recovery, it has built my character, I started training in October 1980, shortly before my seventh birthday, incidentally a month before Victoria was even born, naturally it has formed a large part of who I am, therefore I share a little of my karate history. I have previously written about passing my black belt at 10 years old, way back in 1984, I then passed my 2nd Dan (2nd degree black belt) in 1987 at 13, then a long wait, the rules of our association are such that you have to be 21 before taking your 3rd Dan grading. So I waited, during that time my instructor emigrated to Australia in late 1989, he left myself, just 15 and my friend Darren, a little older at 17, in charge of a very successful club, we were young and the challenge was hard at times, but we worked together well, until Darren’s work and family commitments left me in sole charge a few years ago. When I turned 21 I started to prepare for the grading and passed at my first attempt in October 1995. From there the requirement was to wait a further four years until 4th Dan, at this point I felt no rush, I was still young. To be honest I lost a little enthusiasm, not for karate or my club, but rather for the association we were in at the time, their emphasis was on a core of clubs close to the senior instructors, with just take and no real give for the rest of us small fry. I ran my club, attended the odd course, competed in their competitions, but found no encouragement for me, my training or my club, there was an extremely disappointing conversation with one senior instructor which put the nail in the coffin so to speak in terms of my attachment and loyalty to the association, this conversation I will cover at a later date, it shows the shallowness of those we sometimes look up to for leadership. When the association suffered a split in 2003, I saw my chance to move on, the club met and we agreed to move to the new association that had been formed, I felt a renewed enthusiasm for something new, it wasn’t long before that enthusiasm was rewarded, I finally got recognition. Within a year of joining this new association, I was invited onto the Squad, I was 30, I had been training almost 26 years, I felt like I had finally made it, I was selected for my first European Championships in 2005, I had never abroad at that point, I had to rush through a passport application, a year later I journeyed to Sydney, Australia, for the World Championships, a fantastic trip, which I still intend to write about one day. I had just over four years on the squad, but the 300 mile round trip for training almost every weekend for most of the year took its toll, both financially and physically, so at the beginning of 2009 I took the decision to retire. So upon retirement I began preparation for taking my 4th Dan, my squad instructors had been encouraging me to take it for some time, but I put it off, it was difficult enough for me to concentrate my training for the squad, I had no instructor to return to at my club, no one continuing my training like the other squad members, after the squad sessions finished I was on my own, it was hard, especially since my drinking was on the increase, not a problem or an excuse for numbing the pain at that point, but nonetheless I was drinking more than I should have been. So August came around and to be honest I hadn’t trained anywhere near what I wanted to, but I decided to go for it, with the attitude that pass or fail, it didn’t matter, I was relaxed and just ready to go, I would accept the result whatever it maybe. The grading takes the form of three parts, a series of basic combinations, then onto kumite or free fighting, then kata (a set routine of movements). I completed the basics, a little tight, but I was happy with them, then the kumite. In our group I would be the second fight up, the first fight between two actual club mates took place and well, the taller of the two a six foot plus Nigeria hit his friend and concussed him, when the other guy was taken to first aid I was called to face the six footer, me just 5ft 4½, oh well, here goes! I was pleased with my fight, I just took it to him, in fact he didn’t hit me until the last punch if the fight, he caught me a glancing blow on the nose, drawing a little blood, nothing to bad, I was allowed to sit back down, my fights were done for the time being, so I went to the first aid table just to get some tissue for my nose, then I saw it!!! I looked down to see my ankle twice it’s normal size! This didn’t look right, but I didn’t remember doing it, I remember throwing a few kicks, but don’t remember and significant impact or pain, I still to this day can’t pinpoint a moment when it happened. A friend who was watching, whilst awaiting to take his 5th Dan, later told me later he had winced when I threw a kick which hit my opponent with some force on the point of his elbow, he then said he winced even harder when I did it again, a second time my foot collided with his bony elbow a second time at some force, a gluten for punishment or what? So I looked down to see the swollen mass stuck to my foot, the bruising hadn’t appeared yet, just the swelling, so I asked the first aiders to take a look, immediately their conclusion was it was broken! So as the others fought and the grading continued, I sat with my bust foot wrapped in ice! A paramedic turned up to check out George who had been concussed, he was to be taken to hospital just for a check up, the paramedic was asked to look at my foot, immediately he said it looked broken and I should go too! But I still had part of my grading to do, I hadn’t finished yet, I can’t go!!! Then Sensei Adel came over, he was on the grading panel that had just judged my basics and kumite, the two Senior Japanese instructors where almost done with everyone else’s kata grading, they would soon be waiting for me, could I continue or not? The first aiders did their job, they said no, so he turned to me! At that point adrenalin was still in control, there was no pain, just a swollen mess, so I asked a question I shouldn’t really have asked of him at this point. I asked if it was worth me continuing? He shouldn’t really of answered, but we had a great relationship, we had roomed together on that trip to Australia, so he looked around to make sure no one was listening and simply said yes. That was it for me I had passed the first two parts, including the kumite, which isn’t my strong point and all that was left was kata, which was my speciality, so my answer was simple, let’s do it, I’m ready to continue! So I was almost immediately called up for kata, first my kata of choice, that went okay, the foot held. Then kata of the examiners choice, oh joy, they’ve chosen one with a jump, a jump that will land with all my weight directly on my ballooning foot! In actuality the jump went fine, it was a few moves later, when I simply had to stand up on that foot, that I wobbled, but other than that, I was pleased given the circumstances. After deliberation between the examiners panel, the results were announced, to my relief I had passed, at the point there was still no pain, the adrenaline, the moment, the thrill, the nerves, all these feelings had blotted out any pain, the foot looked immensely painful, friends looked and quickly looked away in discomfort, but I still couldn’t feel it!! Over the coming hours, as the excitement wore off the pain began to conquer all the other feelings, I then had to endure a 3 hours drive home, foot wrapped in ice, sat in the back of an incredibly small car, trying to stay comfortable! The first aiders only let me continue on the agreement I would get it checked out at hospital the next day, when I returned home, but I didn’t actually bother, I was still high on success and I didn’t fancy a long wait in our hospital here in Newark, so I just got on with everything. Over the next few days the bruising came out, the swelling increased and I wore so incredibly loose shoes and got on with my day to day life. 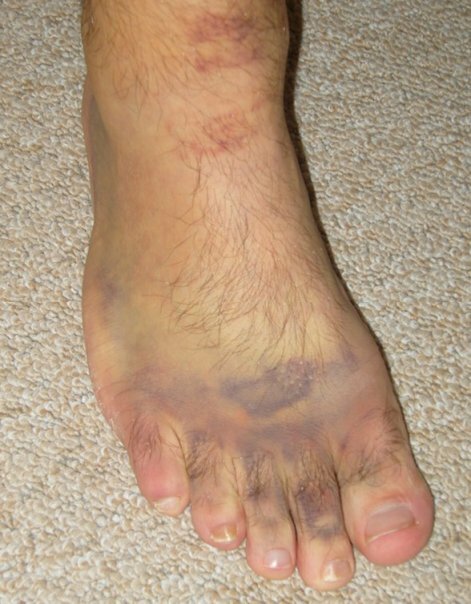 A friend of mine, a former nurse, took a look at my foot a few days latter, he said the bruising showed it was broken in two places, one at the front of the ankle, probably a chipped bone and the other a bone in the right of the foot, which explained the two kicks my friend spoke of, which I just don’t remember. I guess at times our pain can be masked by our other feelings, we can suppress pain, both physical and emotional, it almost always hits us afterwards, sometimes when we think we’re gone far enough to be free from it. Actually I think I’m experiencing this at the moment, my tiredness and physical exhaustion is kind of masking the emotional pain I should be feeling for my Nanna, I haven’t dealt with that yet, I haven’t had the uncontrollable tears yet, I’ve had tears, but not to the point where I just let go, lose control for a moment. That time will come, I’ve felt the emotion come close to the surface over the last few days, but other feelings and circumstances are suppressing it, but I’m sure it will come. For now, I continue to rest, a few more days off, then back to the grind stone again! This entry was posted in Karate, Ramblings and tagged 4th Dan, Black Belt, Black Belt Grading, Broken Feet, Dan Grading, Injury, Karate, Pain on May 2, 2013 by waynemali. I fully intended to post last night, but instead decided it was time I responded to all the comments you wonderful readers have left over the past couple of weeks. I haven’t responded to any comments since I posted NUMB! when I got the news my Nanna had died. I have left my comments for a number of day in the past, but catching up took an hour or so at the most, last night after 3½ hours I managed to respond to half of your great comments, I managed a few more this morning, but I still have so many to respond to and I will get caught up completely over the next few days, I will respond to every comment, when I started this Blog that was what I intended to do and I will do it, I promise. It’s been another long day and I am now both tired and in slight pain! This time the pain is physical, which is good, well good in a sense that it’s not the emotional pain that has blighted my last few weeks, I’ve had a enough of that for a lifetime thanks, but pain of my own making to be honest. It was grading day again today for some of my students, our regular club gradings which happen three times a year took place at Long Sutton, Lincolnshire, not at my own club here in Newark. It’s a long day which includes three hours of training, before sitting through hours of students grading. It’s been a while since I completed three hours of training and I knew I may struggle, my knees mainly, but they weren’t too bad, it was my right shoulder that caused the problems. Fifteen minutes into the three hours, I felt the first twinge, I knew what had happened straight away, I have had this problem before, the pain in the shoulder and arm stem from torn muscles in the back and I knew my back was out, I’ve been feeling it for a few weeks, ever since the weekend when I was helping prepare for the Raise 2013 conference at Church a few weeks back, I knew holding the camera on my shoulder for so long had not helped. Luckily my friend who runs the Long Sutton club is a registered Shiatsu practitioner, after training he cracked my back into place, he’s done it many times before, but never has it cracked as many times as it did today. But the pain in the shoulder will linger for a while, in the past it comes from torn muscles, the tear then scabs over and the scab presses on the nerves that run from the spinal column to the arm, which indicates a pain in the arm which isn’t actually there. The first time this happened my left arm went numb, when I went for treatment and the Physio started poking around my spine, I thought he was mad, the pain was in my arm and shoulder, why is he treating my back, then he found the location of the tear in my back, treated it and sent me home, within a day the pain and numbness was gone! So hopefully that’s all it is, maybe I shouldn’t have done the rest of the training, but I’m not one to sit out on grading days, I don’t get that many chances to train at the level due to teaching, so I try not to pass them up. It’s funny but 52 weeks ago I brought the last bottle of wine into the house, although I didn’t actually quit drinking for another week and half, that Sunday night was the last time I purchase alcohol from a shop and brought it into the house, which was also the day I held that knife at my wrist. There is still a third of that last bottle left, it remains untouched from that night, carefully place in a box with all the other trash of a former life, that box gather dust in the cellar. That means that tomorrow it will be 52 weeks since I met with Gareth, that night he opened my mind to a life with God, he started the snowball rolling, I just had to give it the shove, I’m glad to say that even through the darkness of the last few week, that snowball is still rolling and getting bigger everyday! That also means that on Wednesday it will be 52 weeks since I first prayed to God, now that’s a big one, that moment where I chose in my own time and my own way, to make that connection with God and start that relationship in earnest, it had been one way traffic before that, the Lord pursuing a relationship with me whilst I turned away and ran, I simply couldn’t run no more, there was nothing left with which to run and nothing worth running from anymore, so I simply swallowed my pride and my beliefs and just prayed, the best choice I’ve ever made. The good thing is that I get to spend Wednesday night with my Church small group, new friends who are so supportive, I can’t wait, it will be a great night I’m sure. So an interesting week ahead, with some great memories to deal with this time, here’s to 52 weeks of Sobriety, one year, it’s gone so fast. This entry was posted in Faith, Karate, Ramblings, Sobriety and tagged Alcoholism, Awakening, Black Belt, Celebration, Christ, Church, Depression, Freedom, Friends, God, Jesus, Karate, Nanna, Pain, Poetry, Pray, Prayer, Rebuilding, Recovery, Sixteen Cities, Sober, Sobriety, Stress, Suicide, Walk On The Water on March 17, 2013 by waynemali. Talent Or Gift? Gifted Or Talented? OK, stay with me on this one, I will try to make some sense of this, as I try to explain my views on talented or gifted, I believe the two or somewhat completely different, but of course that is just my opinion, although you may not agree with my theory I hope you understand my logic. I have received so many comments over the last few weeks, so many great comments that have commended my writing, my poetry and my photography, with many uses of the words talent/talented and gift/gifted, which got me to thinking are the two the same or are they different, I came to the conclusion that they were different and I believe very different. To start by making sense of this I have to take you back to October 1980 and the six year old me, I had recently come out of hospital, having had my tonsils removed and had gone to watch my cousin at his karate class, I wasn’t old enough to join, at that time you had to be seven, I remember watching the class from the sidelines and then trying to replicate what they were doing, the instructor noticed me at the side and asked my Dad how old I was, he told him I was six but I would be seven in a few months, so the instructor, Alan Bainbridge, let me join in. Needless to say, I wasn’t actually very good, I was actually pretty rubbish, when my first grading came around I just scraped a temporary grade, which is like a half pass, but you still get to wear your next belt, but if you don’t improve next time you stay the same belt. I carried that temporary over the next few grades until I improved enough to get a grade and a half for a full pass. I struggled along through the grades, although I never got another temporary grade I did fail my black belt twice, before passing on the third attempt. So as I see it, I am not gifted at karate, I had no natural gift for any of it, but I am talented, I have achieved some great things, National Champion, competed at World and European level, but this is a talent I have had to work hard for, it wasn’t a gift, it wasn’t just there, I had to work hard for what I have achieved. Over the years and as I went through the coloured belts and even as a junior black belt, there were many students that were better than I was, I wasn’t naturally gifted at karate, I had no natural talent for karate, I had to work hard. But others came and joined the club that found it easy, they had a natural gift, they didn’t have to work as hard as I did to improve, I had trained for much longer than many, but I wasn’t as good, I probably never would be as good as they would be, they had a gift for it which made it easier for them. But the thing is, that all those that had this natural gift, a gift which made it easier for their talent to show, gave up, they maybe got to black belt and then moved on to something else, I think that because they found it easy, the challenge wasn’t there for them, so they moved on to the next one, for me I wanted to be as good as them, so I trained harder and longer, but still fell short of the talent that their natural gift allowed them, but thirty years later, I am still there and I am the only one from the generation that trained alongside me from the 1980’s that is still training, I the least gifted of them all have worked hard to achieve my level of talent, a level that they never achieved, but could have. So moving right on to 2013 and my writing, my poetry and my photography, many of the comments I have received have used the term gifted, now this time I agree with them, although I don’t believe I am gifted at karate, but I am talented, in terms of what I have achieved with my blog, I will say it is a gift. Obviously when I was at school I had to write and we had to write poetry once in a while, but I had no interest in it, I wasn’t encouraged in it and didn’t embrace it, while I was at school I missed many English course work deadlines and just threw anything together just so I could hand something in, there was no gift or talent then, if there was I never found it. But I first started to notice a gift for writing when I started my journal last year, I started my journal when I started my journey with God, between then and my school years I had written the odd letter at work, but that was about it, I never considered myself capable of writing anything. But when I began to read back a few of my journal entries, within the first weeks of my sobriety, I couldn’t believe that I had actually written the entries myself, I know I did, but the writing just wasn’t me, I never even speak this way I had written many of the things I put in my journal, I was both intrigued and amazed at the fact I could actually write in a way I enjoyed reading. This continued to happen the more I wrote, the more I enjoyed reading what I had written. Then I had the crazy idea to start a blog, which I then promptly forgot about for a week, then I decided again that I would do it, I made a list of things to write about and prepared many of my earlier articles, then another week went by, although I had made a start, I was still no closer to creating the blog itself, I made my usual excuses as to why I couldn’t, the self-doubt took over, then as you may have read in my first post “The Precipice”, God challenged me to start this blog, so I went home and created it there and then. I love the writing in my earlier posts, not that I don’t like what I write now, but when I read these older posts now and my early journal entries, I realise that this ability to write only came to be when I started a journey with God, it was a gift, it had to be, I hadn’t developed my writing over a number of years, like my karate, I just started writing and the words where there, there is no real talent there, just a gift, the most incredible gift from God. The same goes for the poetry, I don’t see it as a talent, again I see it as a gift, it’s not something I have work hard at, I just write when the words are there, that’s not talent, the words are a gift. In terms of the photography, there are sunrises every morning, it’s just that we mostly miss them as we go about our morning routines, I just point the camera at what I see, it’s not really a talent as I see it, I don’t study the light or invest in a great camera to get the best pictures, I don’t put in effort to become talented at it, but the gift is the timing, I have been blessed to arrive at that very moment and just capture what I see, regardless of the quality of the camera or my ability as a photographer, the gift is the timing and the beauty of the sun rises I am privileged to see. Maybe these gifts for writing and photography have always been there, but I never looked for them or maybe when I started this journey with God I was gifted these abilities so I could tell me story, otherwise it may have been just put away in the most untidiest of minds. I think that we all have at least one gift, whoever we are, we all have one thing that we are gifted at, it’s just a shame that so many people never get the chance to find theirs, whatever it may be there is something in all of use waiting to show itself. So I see it like this, to say we have a talent is to say we have worked hard to become good at what we do, we have worked and developed that talent, sometimes from the most disastrous of beginnings, to be the best that WE can be. To say we are gifted is to say that these aren’t talents we have worked hard to develop, it’s to say that this is something we are good at with little effort, we just try it and find it easy. That’s not to say that we can’t be both gifted and talented, we can of course take that gift and make it a talent, not just rely on the gift we have received, but to work on it even harder to improve the level of talent, remember those fellow students of mine that never fully developed their talent, they missed out on the great things that I have done in my karate career, did they travel to Australia to compete at the World Championships, no they wasted their gift. I love the gifts I now have, although I don’t see myself earning a living from them, I do intent to embrace them and work on them to improve my talent, not just rely on the gift. Do you envy the gifts that others have, resenting how hard you are working to improve your own talent? Then you have it all wrong, be encouraged by the gift other possess and use it to inspire improvements it your own talent, then maybe you will take a trip that those with the gift could only dream of. Do you have gift that you aren’t using? Are you like that unopened Christmas present that remains in a box unused, the packaging may look uninteresting and of little use, but inside there maybe something wonderful ready to come out. So what are you, are you talented or gifted? This entry was posted in Faith, Ramblings, Sobriety and tagged Alcoholism, Awakening, Black Belt, Christ, Faith, Freedom, Friends, God, Inspiration, Jesus, Karate, Photography, Poetry, Someday, The Afters, Writing on February 17, 2013 by waynemali. Well it’s been one heck of a long day, I am almost completely exhausted, but in a good way, it’s been a busy, tiring day, but a good one. I started the day with a walk as usual, I was out walking by 5.30am, the snow we were expecting hadn’t materialised, but the sky was full of cloud and light drizzle, so unless they cleared there wouldn’t be another fantastic sunrise like yesterday, but that didn’t matter, I was walking, it was dark and I would once again walk into the light, that’s just how I like it everyday! An eight mile walk this morning up the cycle track, I stopped at the lake on the way back, sat in the constant drizzle and read from the bible. I took that opportunity despite the weather as I wouldn’t be making it to Church today, I had a karate course to attend. The course was only in Grantham, about a twenty minute drive from my home. The course was a National course held by our association, the training was three hours long, but I was asked by our Chief Instructor, Ohta Sensei, if I would teach a section of coloured belts, so for the first hour I taught thirty or so lower grade students, which was both interesting and fun. For the second hour I went back and joined the other black belts, joining in with a number of free fighting drills, which was fun, despite catching my thumb, which is painful and taking a punch to the eye, which will probably be black tomorrow, I might add here I wasn’t supposed to be blocking my opponent, but to trust in their control, it wasn’t a hard punch, it just caught me in the right place, I’ve had harder, but that’s karate, it’s not tiddlywinks after all! After that we did a bit of kata, during which I was then once again pulled out to teach a young black belt lady, who was grading for her second dan (I can’t have been that bad, she did pass), them for the last hour I joined in once again with the black belts for more kata. So a three hour course and I taught for half of that, which I am glad of, I haven’t trained at that level this year, so it was just right, I ache now and probably will ache worse tomorrow, but I’ll still be walking in the morning! On of my students was grading for his black belt in the afternoon, so I took my seat in the grading room and watched the proceedings, he did pretty well and after a long wait for the results his name was the first to be called to say he had passed, phew, both elation and relief, I get more nervous than my students at these things. Another black belt to add to the club’s roster after a long day. The first thing I did when I got home was sleep, it wasn’t a late return, but by 5.30pm I was gone, until just after seven when my kids woke me up, I could have slept right through, but I’m glad they did anyway, I had a bit of work to do. So it’s the end of a very long day, but a very good one, I’m so proud of Morley for passing his black belt and the look on his face and the joy of his parents is enough for me, just to see that is my reward for my work. I’ve already downloaded the podcast from our Church service, I did that within a couple of hours of the service finishing, so I have it ready to play in the morning when I walk, so even though I missed Church this morning, I won’t miss Gareth’s message and if it’s anywhere near as good as last week, I’m in for a great walk, whatever the weather and however much I ache! So I bid you all goodnight and leave you with this song. This entry was posted in Faith, Karate, Walking and tagged Aaron Gillespie, Black Belt, Church, Dan Grading, Faith, Friends, Inspiration, Karate, Kids, Ohta Sensei, Sensei, Sunrise, Teaching, Walking, We Were Made For You on February 10, 2013 by waynemali.